This week we have a question from a very nervous person. First of all, where were you last week? Your column was gone and there was no word as to why. I know I'm not the only one who missed it. Anyways on to my problem. A few days ago I watched this program on TV about 2012. They were discussing the Mayan calendar ending, and whether or not it spelled doom. Well it was pretty late at night and I started getting nervous. I was hyperventilating and my heart was racing. So I ran upstairs to hide under the bed. Eventually I did calm down, but by that time my girlfriend and our guests had all left. So the thing is, I'm not sure how I can ever live this down. Any suggestions? I ate Evan. He was delicious and oddly insightful going down. Kept giving me tips on chewing. To answer your problem, I say why worry what others are saying? Be a man, own up to your fears. Claim them. Others will recognize your bravery and follow you into battle, at which point you can use them as human shields. Cheesy joke about an early bird comes to mind. I was going to comment on your "apocalypse theme" until I saw the "Earl E. Bird" comment.. ROFLMBO!!! dude.. your demented lol GOOD STUFF GOOD STUFF! LOVE IT!! Thanks Aion. Don't worry, you'll have plenty of opportunity to comment on the theme as I'm sticking with it all week. See now this is someone who I can work with. That is precise, useful advice. Good on ya bird in top hat...all I ask is that you don't let your ego get out of control like that worm did. Do you realize he charged me for an hour of advice that was only really 50 minutes? I look forward to many more of your insights unless of course a cat in a sombrero eats you as we work our way up the foodchain. If that happens I say - go with god however you understand him to be - circle of life and all that jazz...hope you get a better reincarnation next time. Yeah, Evan was a bit of a worm wasn't he? I see you've already deduced were the gag is going. C'est la vie. Just enjoy the ride. Did I get the hat right on the next adive giver? And really shouldn't the top hat been your FINAL choice...like what a bearsharktopus would wear? You overplayed your hand my friend. Unless somehow you feel the beanie with propeller is the penultimate head gear choice. I meant regarding the circle of life. 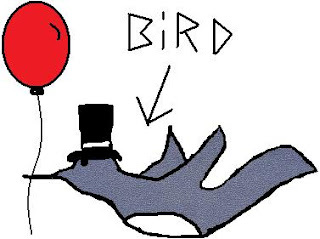 The hat plays no part in it other than the bird in question is one I have been drawing since I was 8. He's just always had a top hat. Though I do love the beanies with the propellers. Or whatever the hell you are. American born, Canadian raised. Best of both worlds. Yeh we Canadians - real or imported are a cuddly bunch. Great...so you can be arrogant in TWO languages. Ah...so you are one of 'those' imports we allowed into the country since 1743. At the time we did the anual baby seal clubbing but most found it to be to far a and cold a journey so insted we fashioned these stong bats with the brothers of the Mic Mac Tribal Nation and declaired we would club no more. Except if they were americans who had crossed our borders to try to steal our women and pine cones. Them we would wack and wack and wack till they weren't dead but had at least started twitching. But I prefer to think of myself as a 'daywalker' like blade.